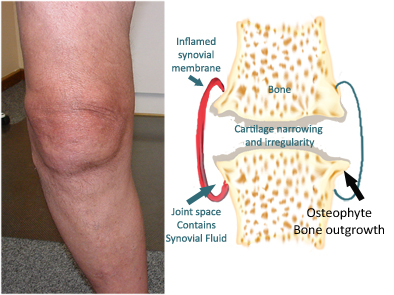 Osteoarthritis is one of the disorders of the bone and cartilage, the special connective tissue lining of the bones in the joints. Many factors play role in its development including genetic predisposition, previous injury, and mechanical forces. 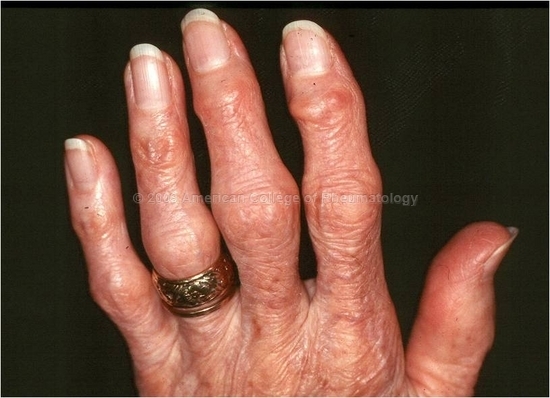 Osteoarthritis can cause pain, stiffness after periods of immobility, joint enlargement, joint instability, decreased range of motion, and cracking/grinding noise made by the joints. 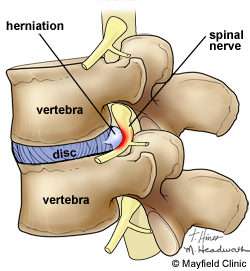 It can cause the weakening of the muscles surrounding the affected joint. The typical joints affected by the osteoarthritis are distal joints of the fingers, joints at the bases of the thumbs, acromio-clavicular joints, hips, knees, big toes and joints of the cervical and lumbar spine. Running or jogging do not predispose to osteoarthritis in the absence of the previous joint injury. Some conditions predisposed to so-called secondary osteoarthritis, when there is a known risk factor. For example, hemochromatosis, Paget’s disease, scoliosis, hyper mobility syndrome, trauma, and diabetes. The treatment of the osteoarthritis is complex and involves the use of non-pharmacological and pharmacological approaches. participation in the self management programs. 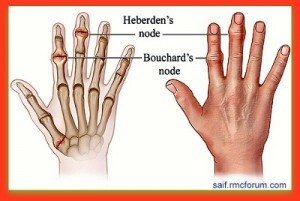 in certain cases patients would benefit from steroid and hyaluronic acid joint injections. 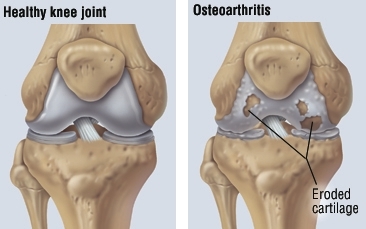 The late stages of the osteoarthritis can be treated surgically (ex, hip or knee joint replacements). One of the important aspects of the management of the osteoarthritis is the education and assessment by the physiotherapist and occupational therapist from the Arthritis society. It is a self-referring service and its offices are located in most of the cities. The website address can be found at the “Useful links” page.